In this day and age, a number of students attending college still represent the first generation of their family to obtain some sort of education beyond a high school diploma. It is certainly wonderful for these first-time students to be branching out and gaining all the benefits associated with a proper education. However, these students (and their families) are new to the processes involved with applying for college, getting financial aid, finding outside scholarships, navigating educational loans, and all the intricacies associated with going to college. Unfortunately, this “newness” makes these students and their families more susceptible to scams and fraudulent activities looking to take advantage of their situation. At CheapScholar.org, we like to talk about ways in which we can help families make college affordable. The tips below focus on helping families save money on college by not falling prey to some of the more common scams related to higher education. Watch out for College Counseling Scams: I have written articles about this in the past but it is certainly worth mentioning again. A good number of organizations and people are providing their services as college search counselors. They help students get into their top choice schools at rock bottom prices (by maximizing financial aid). The majority of these groups are legitimate and have the student’s best interest in mind. Unfortunately though, some organizations have been brought under fire because they utilize some questionable tactics to recruit clients. The Better Business Bureau speaks more about one company’s approach (College Admission Assistance, LLC). Regardless, the important thing to remember before you solicit assistance from an organization or an individual is to check references, make sure they have proper certification (CCPS is a must – Certified College Planning Specialists), and don’t pay them large amounts of money in advance of services being rendered. Closely Monitor Your Identity: Identity theft is running rampant in our country and around the world. However, it has a taken a new twist in that identity thieves are now assuming your identity and using it to register for classes at various colleges (usually large state schools) and obtaining as many educational loans, grants, and scholarship dollars available. Once the funds are disbursed to them they drop off the face of the earth and stick you with the responsibility of the debt (and the bad grades from the non-attended courses). 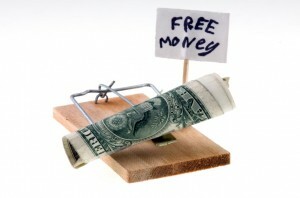 A good way to thwart this is to monitor your credit for free through the FTC. You get one free report once a year from each of the three credit bureau agencies, so make sure you space them out to maximize coverage throughout the year. I hope you find this information helpful. If you know of anyone else that may benefit from these tips, feel free to use the “share tab” below to pass the information along. Also, if you ever find that you fall prey to some sort of scam or fraudulent activity similar to the scenarios mentioned above, you can call the Federal Trade Commission at (877) 382-4357 to file a report and receive advice on how to proceed.